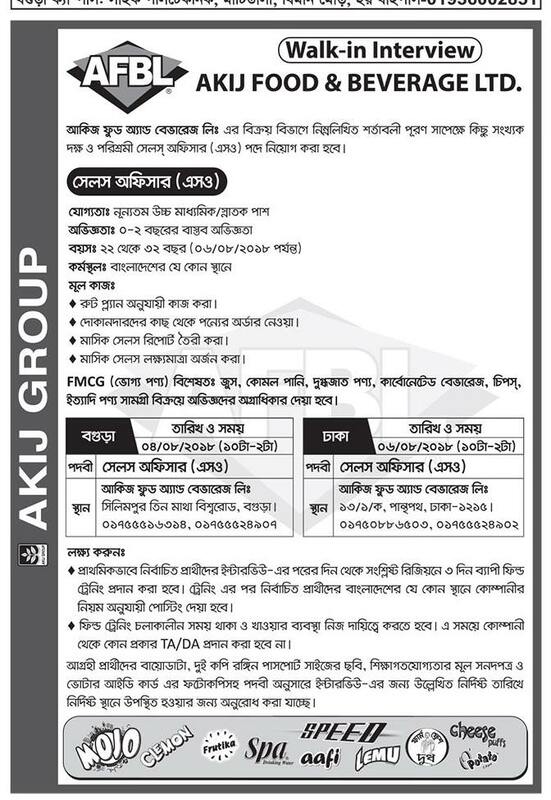 Akij Group Job Circular 2018. Akij group always Offers Attractive & Lucrative career opportunities. Akij group is one of the famous and most popular groups in Bangladesh. History of Akij Group is familiar to all. Eligible and Interested candidates are requested to apply after fulfilling the circularized conditions and instructions. Deadline for Submitting Application is see the attached image job circular for details. Besides these, there are 15 units of industries under its umbrella like cigarettes, handmade cigarettes, printing & packaging, textiles, hand board, pharmaceutical, leather processing and real-estate business are in operation, catering jobs for more than 32,000 people in various sectors. To know more details please see the attached image Job Circular below. Akij Group is also involved in the socio-economic development and cultural activities. The Group has also acquired a modern mother & children hospital. The hospital is being operated as a non-profitable concern by Ad-Din Welfare Trust. Eligible and Interested candidates may apply for the vacant positions after fulfilling the circularized conditions and instructions above. The deadline for submission application is within office time on or See the attached image job circular for details.